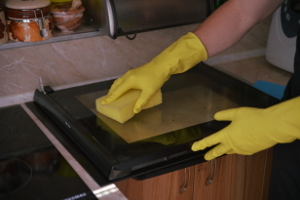 Expert Oven Cleaners Holland Park W8 | RDA Cleaning & Maintenance Ltd.
RDA Cleaning & Maintenance Ltd. can safely, efficiently and professionally clean any type of oven or other kitchen appliance, whether you are a private resident or the owner of a big commercial kitchen. We have more than a decade of experience in providing reliable, efficient and affordable cleaning and maintenance services to the customers in the area. Our professional oven cleaners Holland Park W8 not only can provide you with deep scrub of your ovens but also can do professional fridge, freezer, dishwasher and other cleaning in your kitchen. We are available 365 days a year, and also can provide you with emergency, same day cleaning services too. To get help making your oven look and cook like new - book our professional deep oven cleaning Holland Park W8 service! We are proud to announce you that 95% of the feedback left on our trustworthy oven cleaning services is positive. And we know that this gratitude and regular appearance of new clients by a recommendation from another, old and loyal client, are due to the amazing teams of hard-working oven cleaners we can brag about. All of the cleaners are hired after serious audition regarding their professional experience, previous training and qualification attending courses, personal skills and motivation for hard work. Speaking of which, the enthusiastic never leave a place with unfinished job. And aside from the great final outcome, with our affordable and effective service, you will also receive free tip on cooker, range oven, stove cleaning in Holland Park W8! To book our deep oven cleaning service in Holland Park W8 or another related service, just call 020 3404 1646 or send us an online request here. The customer support is obtainable 24/7, so you will receive a written confirmation within 2 hours. We do offer same day cleaning services too. Otherwise, you can book your oven cleaning for just about any day of the year. The earlier ahead you book, the better the price will be. We demand no deposit for booking. Our fees are fixed, so there are no hidden fees. Book now it is easy and free!